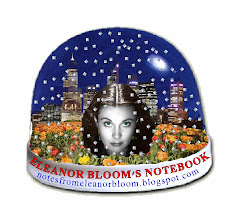 notes from eleanor bloom: Oh PLEASE, let me send you my MONEY! 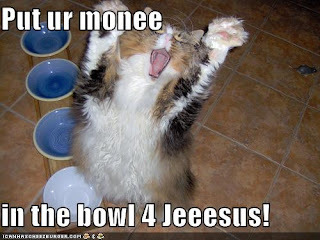 Oh PLEASE, let me send you my MONEY! Mai has encouraged me to share more of my delusions. But, as I'm preferring to go along with them as reality right now *la la la la laaaa happy thoughts happy thoughts* I think I'll dwell on other people's delusions instead. "Do not send your credit card as your signature is sufficient to allow us to debit your account." Mayhap people who do such things (apart from people who are some way cognitively impaired of course) are the same people who fall for scams. I've received some email scams lately. I can pick them by the subject alone. Today's was "KIND ASSISTANCE"
My father was a liability Cocoa and Gold merchant here in Cote d’Ivoire before his untimely death. After his business trip to Tunisia, to negotiate on a cocoa and gold business he wanted to invest in Tunisia, a week after he came back from Tunisia, he had an accident with my mother of which my mother died instantly but my father died seven days after in a Private Hospital. [note: private hospital, ie. we really have money; also, it's a nice detail that and the 7 day thing. Cle-verrr.] On that fateful afternoon, I didn't know that my father was going to leave me after I had earlier lost my mother, *sniff* but before he gave up to ghost, it was as if he knew he was going to die. He instructed me to seek for a Reliable, God fearing and Trustworthy business partner for my life time investment. Now I have succeeded in locating the deposit documents and the bank where this money is been deposited. Due to my inexperience in business here in Cote d'Ivoire, I am now seeking for your assistance to help me transfer this money from my country to your account so that we should invest it in any meaningful and lucrative business in your country in which you will suggest because this is my only hope in life. I am willing to offer you 20% of the total fund if only you can help me out of my present predicament. (2.) To make arrangements for me to come over to your country after the successful transferring of this money into your account and to come and further my Education. (3.) To help me invest this money in a profitable business, since I do not know much about business. (5). I want you to promise me that you are not going to betray me after the money gets into your account. The worst part of it is that my uncle is planning evil against me over this money because i refused to hand him over the documents covering this money, He has sold all my father's landed properties including his cars which Rightful belong to me and now he wanted me to hand him over the banking documents of my father in my possession which i refused. Now he said that he will have this money by all means even if it means killing me, [OMG!!! OH NO! EEEK! etc.] so because of this I ran away from home and hide in a Guest House, pending when this money will be transferred so that i can leave the country for my safety. Please i am looking forward to hear from you, Thank You and God bless. Really, their continued insistence upon CAPS is a dead giveaway. Before the death of my Father, he made deposit with a security company, in SOUTH AFRICA. The consignment was cleared to contain GEM STONES shipped on diplomatic cover to avoid customs detecting the actual contents. The actual content is the sum Of US15.5 million (Fifteen million, Five Hundred thousand United States dollars only). ... This land problem came when Zimbabwean President Mr.Robert Mugabe Introduced a new Land Act Reform that wholly affecting the rich white Farmers and some few black farmers alike. This resulted to the killing And mob action by Zimbabwean war veterans and some lunatics in the Society. In fact a lot of people were killed because of this Land reform Act For which my father was one of the victims. We have been under close Watch by the authority hence we cannot travel to take Delivery. I am Seeking for a partner who I have to entrust my future And that of my Family in his hands. I must let you know that this Transaction is % 100 risk free. If you accept to assist us, do please contact me with Either my telephone or email, as stated below to Finalize all the Arrangement with the security company for the delivery Of the Consignment to you. I will conclude all arrangements with the security Company to clear The consignment (funds). I will also enlighten you on The sharing (65%/35% basis) and the subsequent investment to be Made in your Country with our share with your advice. Well, God has blessed me... with some COMMON SENSE! Who would fall for such things? Maybe the same people who invest in pyramid schemes (and send their credit cards in the mail!! (sorry, still getting over that one)). I am the widow of former Taoiseach of the Republic of Ireland, Charles J. Haughey [he actually existed. sneaky sneaky...] who passed away last year (May his soul rest in peace) and daughter of former Taoiseach of the Republic of Ireland and heir to de Valera, Sean F. Lemass. The urge to ignore this email will be high, but I want you to accept it in good faith, with humility as a divine calling and not to ignore this email or it's contents. OK, with all this blessing and 'divine calling' stuff I'm wondering if it's fundamental Christians who fall for these schemes. I mean someone must be falling for it cause why else would they keep doing it? It [claiming the money, 30million Euros] will be very easy, risk free and 100% legal as I will take care of all the legal documents needed to make you the sole beneficiary of this funds on my behalf. I have also set aside 10% of the total funds as your share, i.e €3,000,000 (Three Million Euros) for your work in assisting me move the funds from where it presently lies to a new account in your name that will be managed by you. Thank you very much for your time and attention. I look forward to hearing from you. Yeah, I bet you do! I have all their emails (so I can return them my personal account details!). But, I figure, if I sent them back something nasty they'd probably email me an impressively destructive virus. So I shall refrain, and act like the lady I am... posting them on my blog for some mild amusement. Anyone know someone who has fallen for a scam (apart from that woman on Judge Judy)? * Of course they're all from the same person; who is surely developing quite a multiple personality disorder at this stage. Actually, there are probably at least two people working on it together. I mean, so you can have different voices on the answering machine.